This section of the proposed pipeline would not cross an international border into the United States, and so would not be part of the Presidential Permit process. On January 18, President Barack Obama denied TransCanada’s application for the construction of the Keystone XL Pipeline that would have carried oil 1,700 miles from the Canadian tar sands in northern Alberta across the border to refineries on the Texas Gulf Coast. 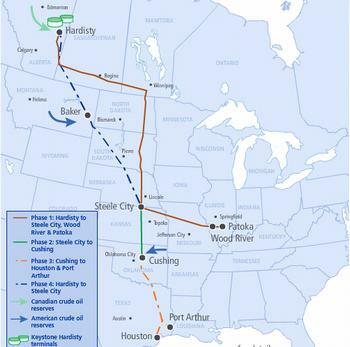 The approximate cost is US$2.3 billion and subject to regulatory approvals, TransCanada anticipates the Gulf Coast Project to be in service in mid to late 2013. Cushing is a major oil supply hub, holding up to 10 percent of the total U.S. crude inventory. Signs made of a pipe and valve on the major highways near town proclaim Cushing to be the “Pipeline Crossroads of the World,” and the town is surrounded by several tank farms. Separately, TransCanada gave the State Department advance notice of its intention to submit a new application for the cross-border segment of the Keystone XL pipeline, from Canada to Steele City, Nebraska, once a route through Nebraska has been identified. TransCanada said it will continue to work with the State of Nebraska on determining an alternative route for Keystone XL that avoids the Sand Hills, which overlie the Ogllala aquifer, source of drinking and irrigation water for much of the Great Plains. TransCanada has been working on assessing the Nebraksa route since November 2011, following the State Department’s notice to delay a decision on a Presidential Permit until an adjusted route that avoids the Sand Hills is developed. The original route would extend 254 miles of the pipeline through Nebraska directly over the Ogallala Aquifer. Current state law does not allow Nebraska to study routes of the TransCanada Keystone XL pipeline. Since TransCanada’s permit was denied, the company no longer falls under a law passed during the Pipeline Special Session of the Legislature last year, that gave the Nebraska Department of Environmental Quality the authority to study alternative routes in conjunction with the State Department and at the expense of $2 million Nebraska taxpayer dollars. A new bill in the Nebraska Legislature would provide a special exception for TransCanada to have their new route analyzed before Nebraska gets regulations in place at the Public Service Commission. TransCanada does not want to wait for the Public Service Commission to put their oil pipeline study regulations in place, which could take up to a year asthe Commission is seeking expert and public input. 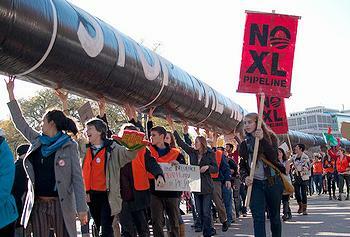 Environmental groups, farmers and ranchers have been up in arms against the Keystone XL pipeline and are opposed to TransCanada’s new plan to build the pipeline section by section. “With TransCanada it’s safety last. 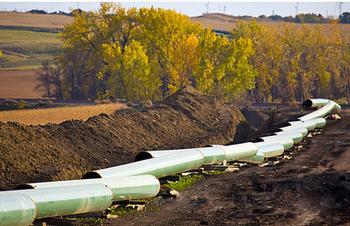 The first U.S. Keystone pipeline averaged a leak a month. But the company can’t wait to divert tar sands crude oil from the Midwest to the Gulf, raising American oil prices and, likely, also gasoline prices. This Oklahoma to Texas segment of the Keystone XL pipeline will mean more tar sands converted to diesel and available for export overseas,” said Brune. “While TransCanada does not require a presidential permit for the southern half of the pipeline, it still must secure land along the proposed route. Since few people are eager for a pipeline carrying corrosive tar sands oil to run through their backyard, the company has resorted to using eminent domain to grab land away from property owners,” said McKibben. Girling said TransCanada’s commitment is “to treat landowners with honesty, fairness and respect. The company has negotiated over 99 percent of voluntary easements in Texas and close to 100 percent in Oklahoma. Easements make up the route of a pipeline and are similar to an easement for water, sewer and utility lines. Residents maintain ownership of the land and landowners receive a payment equal to or greater than the land’s market value.